This week, K-5th has been playing Very Valentine Ask Away, and I'm learning some important lessons about incorporating questions into my lessons. Not answering, asking. That's where the title of this blog post comes from - asking questions is difficult for many of my students. 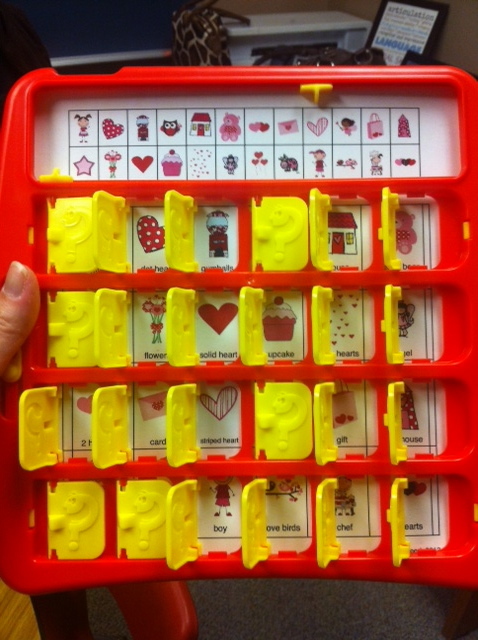 This game is very similar to Guess Who? For the most part, the students have been playing in groups. The pages are in sheet protectors, so the students can use dry-erase markers to cross out pictures as we go along. Here's an example. I have circled "cupcake", and the students have crossed out pictures based on the questions of "Does it have polka dots?" and "Can you live in it?" We'll continue to ask questions until there's only one picture left. To erase, just use a tissue or eraser and start all over! Here, the selector is on the striped heart, and a few windows are closed based on questions. The 3rd-5th graders have done pretty well with this game and have been mostly working on artic, social skills, and asking longer questions. They are also able to take turns being the chooser, and this has encouraged more interaction. You can't name the picture until there's only one picture that's not crossed out. You can't ask a question that's been asked before. You can't ask a question that doesn't eliminate at least one picture. Here are a few examples of what I've seen. Me: We have too many blank spaces. You can't guess flowers yet. Ask another question. Me: We are going to ask questions about the characteristics of the picture. Student: (looking at a girl) It's wearing a dress. Me: (my choice is something else) Ask a question. Is it wearing a dress? Student: Is it wearing a dress? Student: You're kidding me! The girl is wearing a dress! Student: It does have polka dots? Me: Does it have polka dots? Student #1: Can you live in it? Student #2: Is it an animal? Student #3: Can you live in it? Me: Yes. What can we cross off? Student: Nothing. Awww, I messed up! I am so focused on sentence production that I forget about teaching students how to ask questions. My language-impaired students need to know how to ask questions to ask for help in the classroom and to carry on conversations with others. Trouble with perspective shows up. Difficulty with tasks required in the classroom - knowing what characteristics means - is there. Doing a fun activity has opened my eyes to an area of syntax I often forget about. If my students have trouble with sentences, how are they going to manipulate their thoughts into questions? 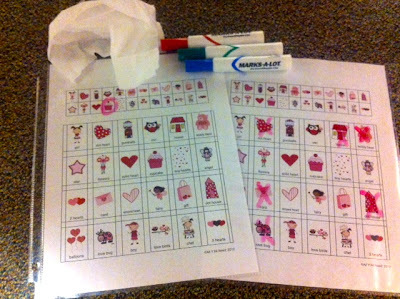 What's been going on in your therapy room this Valentine's Day? Pam, I'm so glad you could relate to it!